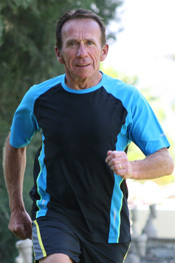 Come and join us at the Running Room for our weekly Run Club - it's FREE! We have practice runs and walks from all Running Room locations on Wednesdays at 6:00 p.m. (times may vary depending on location) and Sundays at 8:30 a.m . Practice is absolutely open to all runners and walkers as we send out multiple groups under the leadership of pace group leaders. 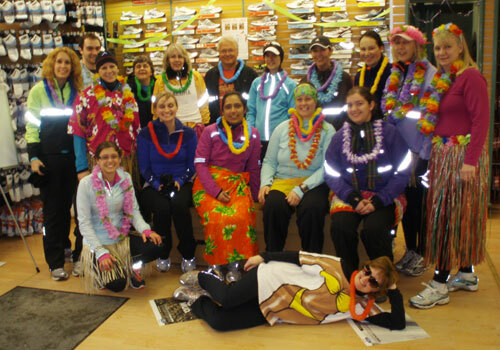 You can take advantage of running or walking with a group and meet new friends. Join us for the fun and motivation. In addition, as a member of the Running Room Run Club, you will receive free access to the Running Room Run Club On-Line. 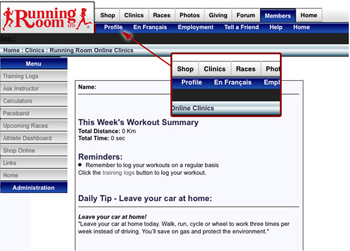 As an on-line member you will have access to your own customized training log, manage your own personal profile and receive weekly Running Room Run Club updates on local events in your area. This is a feature that we have built to allow you to log and track your personal training. Track your workouts by day, week and month. You will be able to see the total distance and time committed to your activity. Keep track of whom you trained with, the weather; how you felt during the activity, add in personal notes. Record the hours slept, your resting heart rate, weight and even what shoes you wore. An added feature allows you to track the mileage put on with your current shoes. This will allow you to gage how many miles you have on a particular shoe and help you determine when you are getting close to replacement. We will soon be adding utilities, which will graph your workouts as well. In addition you will soon have the ability to set training programs up and then compare your actual progress to those goals. The pre-planned workouts function lets you put a training plan from our site into your log, day by day, as a reference. Select the program, which fits your needs, and scheduled workouts, will be added to your log. All Training Log information is confidential and viewable by you - no other member can see this information. The profile page is also where you can change/update your e-mail address, password, metric/SI settings and other personal information. You will see only your own profile and can update it at any time. Do you want to know what training programs and events are coming up? Simply go to your profile, choose a city and store location on the menu and you will receive weekly message updating you on "What's Happening" in that area. 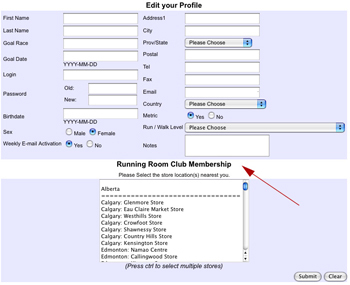 You can choose as many cities as desired and you will receive a weekly Run Club e-mail from them all. If you do not want this message simply de-select the option, it's that easy. Learn to Run, For Women Only, 5K Training, 10K Training, Half Marathon and Marathon training programs here. Find information about our walking training programs including: Walk Fitness, Walk 5K, Walk 10K, Walk Half-Marathon and Walk Marathon here.